The Volfas Engelman brewery is steeped in history and its roots date back to the mid-19th century. Situated in Kaunas, the second-largest city in Lithuania, Volfas Engelman is the second-largest brewery in Lithuania and manufactures, among other things, varieties of beers, ciders, energy drinks and alcoholic cocktails. 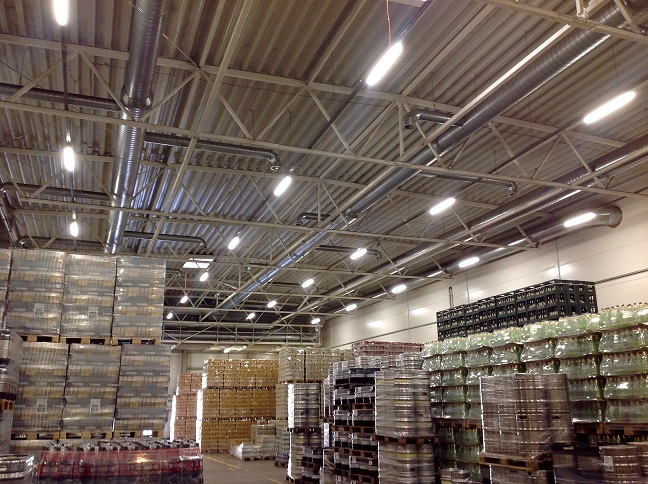 To help with the refurbishment of its premises including the factory, packaging area and general warehouse, the brewery approached ECOLIGHT, a Lithuanian lighting company and OEM partner of CP Electronics. The project ran from mid-2017 and completed in April 2018. “We needed to provide a solution that would cope with the varying levels of height within in the buildings and that would allow for complete lighting control in all areas, even when they are not in use. “Rather than fitting one PIR per luminaire, we recommended using one PIR per group of 3-4 luminaires. This would mean that the installation could be done more quickly and more cost effectively while providing excellent lighting coverage. 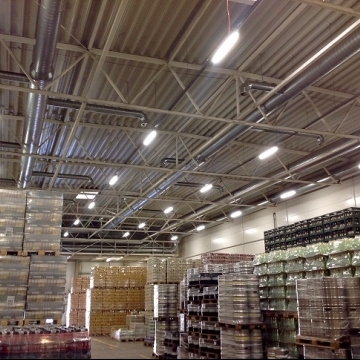 “We used sensors from the EBDHS-MB range which are ideal for high-bay, high-level lighting control in warehouses and factories and can easily be retrofitted to luminaires.